Mention the House of Puiforcat to any world-class designer and they will wax lyrical about the quality and craftsmanship of the contemporary silversmith company. Known for creating exceptional pieces that are favoured by connoisseurs and collectors alike, Puiforcat is also respected for creating functional objects that work for everyday use. The family company has a rich and long history in the fine craft of silversmithing, beginning in Paris in 1820 when it was founded by Jean-Baptiste Fuchs and his distant cousins Emile and Joseph-Marie Puiforcat. It was here that the company’s blueprint for style was born, and later, under the influence of Louis-Victor Puiforcat, some of the house’s most famous collections were created. During the 20th century, under the leadership of famous artist (and co-founding member of the Union des Artistes Modernes) Jean Puiforcat, the company entered the forefront of modern silversmithing against the backdrop of the art deco movement. The house has since stuck to its roots of straddling the worlds of both art and functional design. As a company that prides itself on being both forward-thinking and loyal to its traditional roots, the House of Puiforcat’s contemporary pieces hold as much esteem as its earlier designs. Both its classic and most contemporary pieces have been placed in museums and appreciated by art fans the world over. Two examples of this are the Anne of Austria beaker, a replica of the gold chalice once belonging to the Queen of France that now sits in the Objets d’Art department of the Louvre, and Puiforcat’s solid steel cutlery set, Zermatt, designed and launched in 2010, which has already been included in permanent collections of the Centre Georges Pompidou Museum in Paris and the Museum of Arts and Design in New York. Through this history and the expertise of its craftsmen, the House of Puiforcat is able not only to reproduce classic masterpieces from Louis-Victor Puiforcat’s silverwork collection and to draw inspiration from Jean Puiforcat’s art deco sketches, but also to work closely with today’s designers to create contemporary pieces that are reinventing gastronomy and becoming design classics of the future. Three of these current collections include the Zermatt, the Puiforcat Orfèvre-Sommelier and the Cercle d’Orfèvre. 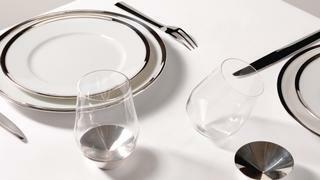 Zermatt, a solid steel cutlery set, was designed by prestigious interior architect Patrick Jouin in 2010. Notable due to its sharp edges, elongated lines and surfaces polished to a mirror finish, the designs were a nod to Jean Puiforcat’s own creations and are a symbol of a design that relates directly to touch and taste. The Cercle d’Orfèvre collection mixes two starkly different materials to create a unique design – delicate and fragile porcelain plates with a contrasting rim of sturdy sterling silver. The designs pay homage to the elegant custom of the past where porcelain plates were encased in metallic armatures in order to keep them safe during travel. Each piece can be completely customised, too, whether that be a pattern inscribed on to the porcelain or a message engraved into the metal. Perhaps the best example of the house’s commitment to pushing the boundaries of avant-garde design is its Puiforcat Orfèvre-Sommelier collection, which is entirely dedicated to the sublimation of wine. 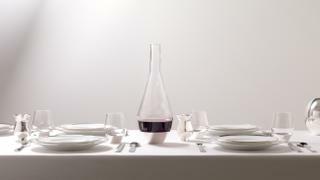 A collaboration between the world’s best sommeliers, chefs and designers led to unconventional, innovative designs that combine glass and metal, while ensuring that the taste of the wine is at the forefront of the design. 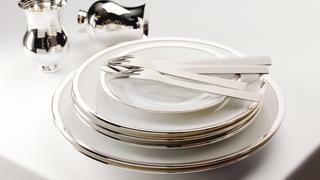 For tableware that are collectables in the making, your first stop should undoubtedly be the Parisian silversmith.